As 2018 approaches, I thought I’d take a moment to reflect on some of this year’s activity and achievements. Earlier in December bayton.org finally reached (and has since overshot) 100,000 visits. I sent out a brief tweet to mark the occasion. 100K, while not significant compared to the big sites out on the web, is a nice milestone for me and my humble website; that’s 100,000 of you who’ve stopped by to read what I’ve written and for that I’m extremely grateful! Here’s to besting that in 2018! Both of these in-depth, easy-to-follow guides have helped thousands of readers set up lightweight virtualisation environments and start hosting their own data, taking back control from the likes of Dropbox, Google Drive, Flickr and more. Some, like myself, may have even combined both in one environment! The consistently growing traffic to these articles over the last year, combined with the oodles of positive feedback I’ve received, tells me I’ve done a good job of writing these guides and I’ll aim to create more like it in 2018. In 2018 I’ll be looking to double-down on this. Should documentation start entirely overshadowing the blog content on the site, a redesign and shift of focus may be on the cards to ensure docs are front-and-centre to visitors old and new. The US takes top-spot for most visitors in 2017 with almost 20% of all views, followed by the UK, Germany and France. 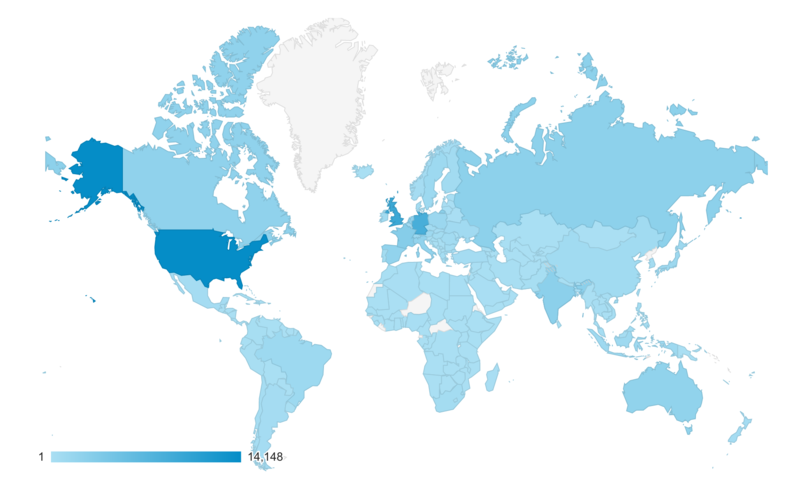 As the graphic shows though, almost every country in the world popped by to say hello at some point! The social dominance in the list reflects a much stronger focus on social media this year, both automatically sharing new posts and manually resharing them while utilising targeted hashtags, keywords and other means to reach the biggest audience. I’ve also dabbled a little more with Twitter and Facebook marketing, the latter clearly hasn’t paid off given it didn’t make the top 5! 2017 equally marks the year I started to invest time into LinkedIn. For many years although I’ve kept my work history very much up to date, I used LinkedIn only really for the occasional post, job search or profile update and got very little out of the platform (despite landing my last 3 roles through it!). Using it as a primary platform for enterprise topics (with Twitter in 2nd place) has been very rewarding despite the lower referral rate. The amount of mentions I’ve received from others sharing my posts has increased considerably also this year, particularly in the last 4 or so months with active users frequently sharing content. This also ties in with the increasing popularity of enterprise documentation. As a value-add to my enterprise documentation I’ve additionally started publishing downloadable resources around Android. With over 400 downloads to date I’m very pleased, it’s definitely worth the effort and I’ll therefore be publishing more downloadable content next year! That pretty much covers off the website, so what else happened in 2017? I joined Brian Madden’s team of external contributors and published my first article. I discovered, and was therefore one of the first ever to provision an Android enterprise device using a QR code with MobileIron Core, leading to accelerated support for the option only 2 months after publishing my findings. I’ve been able to work closely with Sony, HMD Global (Nokia) and others while testing Android devices for Android enterprise compatibility. I fully intend to continue this next year. I’ve gained connections with all of the leading EMM vendors through my independent EMM documentation – MobileIron, AirWatch, MaaS360 and SOTI – as well as continuing to work with Miradore and Google around Android enterprise. I joined CWSI as their first UK engineer after being made redundant from Vodafone (before being rehired in another role and later leaving) and have been working with customers all over Europe and more. CWSI’s support and encouragement towards this website has been truly incredible and definitely a key factor in focusing far more on the content this year (as well as publishing on the corporate blog, of course). I’ve worked with big names like Wandera, and a number of independent developers in order to test and advise on the Android enterprise managed configuration implementation for managed applications; it’s been fantastic to be involved and I’m looking forward to some exciting announcements around this next year. Happy new year to all of my visitors, and I hope to see you all again soon as bayton.org turns 10 years old!